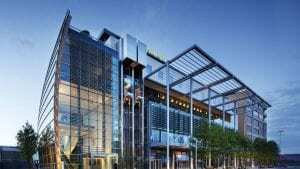 The Convention Centre Dublin (The CCD) is located in the Dublin Docklands, in the heart of the capital close to the main transport links and convenient to many Clayton Hotels. 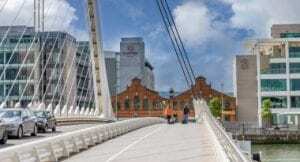 Guests staying at either Clayton Hotel Cardiff Lane or the gibson hotel can easily walk to the Convention Centre Dublin. The red Luas (tram) line runs behind CCD, Major Square and Spencer Dock are the closest stops. Clayton Hotel Charlemont and Clayton Hotel Leopardstown both have Luas stops within 2 minutes walk of their front doors. Change from the green Luas line to red line at O’Connell – GPO/Abbey Street. Both lines offer fast, frequent services throughout the day. Clayton Hotel Ballsbridge and Clayton Hotel Burlington Road are approximately 3km from the venue with convenient public transport links. Airlink Express 747 and 757 services stop at The CCD with buses up to every 10 minutes. Guests staying at Clayton Hotel Dublin Airport can take advantage of the complimentary 24-hour shuttle bus between the hotel and Dublin Airport terminals. 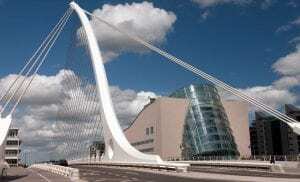 The Convention Centre Dublin (The CCD) in Dublin docklands, in the heart of the capital. Adjacent to 3Arena in Point Square, opposite Luas stop.